More than half of computer users pick the largest size external drive they can afford and then shop around for the best price. Outside of the type of interface, not much else is considered. That may be fine for general purpose computing, but not for professional audio and video. For those doing audio and video post production, the decision is a bit more challenging. Technical specs matter. Speed of the drive is important, as well as the transfer interface and the cache size. 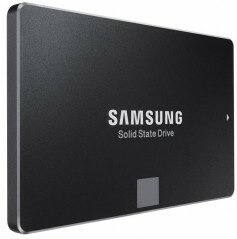 A decision must be made whether to spend extra money for SSD or PCIe. RAID and NAS configurations might be considered if simple plug-and-play external drives would not do the job. B&H Photo, a major pro video and audio supplier based in New York City, sells every conceivable kind of memory for both audio and video. The company recently published an article on some suggestions to buy. For video editing, B&H cited speed and delivery as of utmost importance. That’s why professional video editors would be better served by SSDs or external drives that use Thunderbolt connectors. Users should know how much space they need before shopping for a drive. A good rule of thumb is that video editors need twice as much storage as the source material size. So if your source material is 50GB per hour of footage, you should be looking at 100GB of storage for post-production. If you’re looking at transcoding footage, lots of effects or multiple renders (common for feature films) then you may need three or four times original source file. For professional video editing, having an SSD over a traditional spindle hard drive is always a boost. The speeds gained with the file copy or write speeds on an SSD are about five times over an HDD. The file opening speed and boot-up times for an SSD are about 30 percent faster than their HDD counterparts. 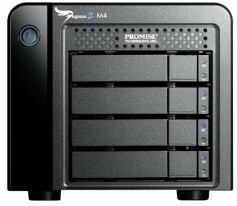 Promise Technology 2TB Pegasus2 M4 Thunderbolt 2 RAID Storage. The Pegasus2 boasts a staggering 20 Gb/s speed - more than enough to effortlessly handle and accelerate any 3D or 4K UHD workflow. Has dual Thunderbolt ports for daisy chaining additional enclosures, Apple Thunderbolt displays, or Mini DisplayPort devices. Click to enlarge. That’s why a unit like the Promise Technology 2TB Pegasus2 M4 Thunderbolt 2 RAID Storage Array might be the storage solution you need for high-end jobs. It features dual Thunderbolt 2 ports for speedy delivery of data, and four hot-swappable drive bays. Although pre-configured in RAID 0 mode, it supports RAID 0, 1, 5, 6, and 10. Users can daisy-chain six Thunderbolt 2 devices, which is good, because the 2TB total may be slightly less than needed. 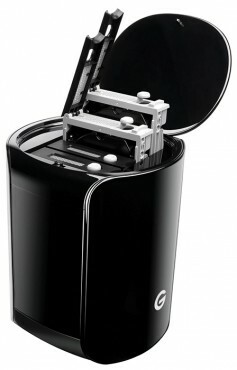 G-Technology 24TB G-SPEED Studio Thunderbolt 2 External Storage System is expandable to 24TB with selectable raid mode. Another option is the G-Technology 24TB G-SPEED Studio Thunderbolt 2 External Storage System, which features 24TB storage capacity (via four 6TB 3.5-inch Enterprise Class Drives) and dual Thunderbolt 2 ports, with RAID 0, 1, 5, and 10 compatibility (the unit comes preconfigured in RAID 5) with a 700 MB/s RAID 0 transfer speed. That should be enough storage for any project, and it costs about half the price of the Pegasus model. For audio recording, storage options for professionals vary, but it’s normally broken down into four basics: operating drives, write drives, sample library drives and back-up drives. Post-production storage needs for audio can be found in this excellent article called Save Your Music: The Basics of Hard Drives for Audio, which breaks down the usage of each component. The Samsung 850 EVO optimizes performance boasts sequential write speeds up to 520 MB/s with TurboWrite technology and sequential read speeds up to 540 MB/s. Plus, the drive offers a RAPID mode to further boost performance bu up to 2x. Click to enlarge. B&H offered some updated suggestions, including a Samsung 1TB 850 EVO 2.5-inch SATA III SSD for the operating drive, which will house your operating system, DAWs sample library and plugins. It features 1TB capacity, a small 2.5-inch size for small-form-factor PCs and up to 540 MB/s read and 520 MB/s write speeds. The write disc fulfillment can be handled by external hard drives, which should contain, if possible, SSD and Thunderbolt (or at least USB 3.0) connectors. The LaCie 500GB Rugged Thunderbolt External SSD with USB Type-C Port features both of these, along with USB 3.0 ports and bus power for portability. The powerful Glyph Technologies' StudioRAID is a high performance, ultra-reliable hardware RAID with USB 3.0, Firewire 800, and eSata connectivity. It supports RAID 0, 1, JBOD, and SPAN modes with transfer rates of up to 360 MB/s. Click to enlarge. A favorite among audio professionals, as well, is the Glyph Technologies StudioRAID TB 6TB 2-Bay Thunderbolt 2 RAID Array. While it doesn’t feature SSD drives, it does feature 6TB of storage and Thunderbolt 2 connectivity, which also allows users to daisy-chain other Thunderbolt devices (including monitors). It’s also RAID configured for even more reliability. Backup drives and sample library drive requirements can be handled with a combination of extra internal SSD or HDD drives or external SSD or HDD drives. You’ll want portability when moving from studio to client, or when you want to take a laptop and not lug around your desktop machine, but you also want at least USB 3.0 or Thunderbolt connectivity. B&H said the drives outlined constitute their recommendations for those looking to install, upgrade or browse storage drives for specific needs. Of course, there are many more brands and types. The bottom line is when doing professional video or audio, don’t just shop for the lowest price. Carefully match the specs with your system and the size of your project. It will save time, money and frustration later on. Skimping on storage is never wise.